Key Bet Roulette from SG-Gaming is one of the most popular bonus roulette games, having been released several years ago and going largely unnoticed, Key Bet Roulette featured a resurgence when people finally worked out it is possible to make money on these roulette games found in all Coral and Ladbrokes betting shops. The game revolves around a standard roulette wheel with the addition of a progressive pot and cash multiplier bonus nestled opposite the zero, between red 5 and black 10. This effectively breaks the wheel into two halves, leaving the low red and high blacks on one half, and the low blacks and high red on the opposite half. 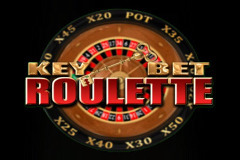 Key Bet Roulette is random, although the game exhibits some very odd behaviour at times which makes many people question how the randomness works, or whether it is in fact random at all. We have to assume that the game is random and the odds we see are the odds we are getting, this would put the odds of landing in the Key Bet bonus position at 38/1 with a further series of multipliers pushing the odds of hitting the progressive pot at 12/1, making for a 456/1 chance of winning the progressive pot. Although longer odds than Lucky 8, they are the same as Extra Bet, and when you break it down to playing time, you can successfully play three spins a minute, making the quest for the Key Bet pot not longer than several hours in the majority of instances. The main reason for playing Key Bet Roulette is for the progressive pot, and like Extra Bet Roulette, Key Bet is really only worth playing if the pot is above £210 on the £5 per spin versions, and around £60 on the 5p/£1 version. This isn’t an exact science, and the odds only really come into play long term so use those figures only as a guide. Unlike Extra Bet, Key Bet Roulette also offers the option to gamble your wins in the exact same way as Super Gambler Roulette. The gamble has far better odds than William Hills' Bonus Roulette, and also allows you to change the odds for potential wins of up to 50x your bet. This makes Key Bet Roulette not only good to try for the pots and win multipliers, but also for the chance to gamble any win up to £500. There are no progressive pot roulette games online, but there are many that offer different types of bonus, including several that have the option to increase your odds by a massive 25,000 such as Hot Streak Roulette.